This is a visualization I created for the Transmutations exhibition at the Gray Area Foundation for the Arts. 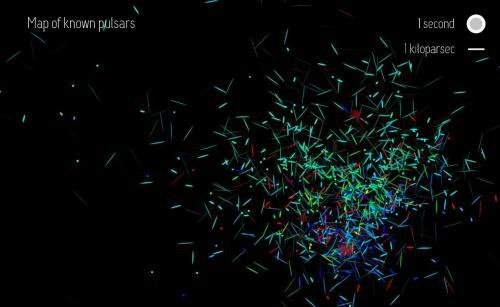 Each object in this visualization is a pulsar. Pulsars are neutron stars -- the ultra-dense remnants of collapsed stars. Neutron stars typically have a mass greater than our sun, but a radius of only about 10 miles! Like a figure-skater pulling in her arms to spin faster, a slowly rotating star can end up spinning very fast after it collapses into a neutron star (up to hundreds of times per second!). A neutron star may emit a beam of intense radiation which points in different directions as it spins. From earth, it looks like the star is blinking on and off as the beam is pointed toward and away from us. This called a pulsar. The objects in the visualization correspond to observed pulsars from the ATNF Pulsar Catalogue. Each pulsar appears at its observed coordinates in the galactic plane and is blinking at its observed frequency. The color is based on the frequency of radio waves emitted by the pulsar: redder points emit more low-frequency radio waves, while bluer points emit more high-frequency radio waves. A clock appears in the top right corner of the screen and is ticking at a rate of once per second in the time-frame of the visualization.